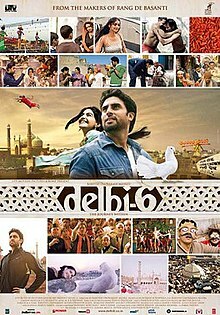 Delhi-6 is a 2009 Indian musical drama film directed by Rakeysh Omprakash Mehra and starring Abhishek Bachchan, Sonam Kapoor, Om Puri, Waheeda Rahman, Rishi Kapoor, Atul Kulkarni, Deepak Dobriyal, Divya Dutta and Aditi Rao Hydari. The story is reportedly based on Mehra's growing up years in Chandni Chowk area of Old Delhi. The number 6 refers to the Postal Index Number (PIN) code of Chandni Chowk area of Old Delhi, a shortened form of 110006. It is Mehra's third film after Aks and Rang De Basanti. The acclaimed score and soundtrack was composed by A. R. Rahman. It released on 20 February 2009 and won the Nargis Dutt Award for Best Feature Film on National Integration at 57th National Film Awards. Roshan (Abhishek Bachchan) accompanies his dying grandmother Annapurna (Waheeda Rahman) to their ancestral property in Old Delhi. Roshan is initially stunned by the mad rush of neighbours: Ali Baig (Rishi Kapoor) the renaissance man, feuding brothers Madangopal (Om Puri) and Jaigopal (Pavan Malhotra), their wives and families, Mamdu (Deepak Dobriyal) the halwai, Gobar (Atul Kulkarni) the simpleton, Sethji and many others. Roshan eventually warms to the place and wholeheartedly embraces the sense of community. He accompanies his grandmother to the Ramleelas, hangs out at Mamdu's sweet stall, plays with the children, and gradually becomes steeped in the culture. Roshan is also slowly exposed to some sobering realities. When Annapurna faints (due to fluctuating blood sugar levels) and they scramble to get her to a hospital, he finds the roads choked by traffic because of an impromptu ceremony around a cow in labour; he is further surprised when his grandmother, despite her stupor, stumbles forth to seek the blessings of a sacred cow; and he is astounded when the local police seem to encourage the practice. Roshan begins to understand the feuds and social issues in the community. Madangopal's sister Rama (Aditi Rao Hydari) is unwed (at an age when spinsterhood is a significant social no-no) and Jaigopal's electrical business is going nowhere. The lecherous old local money lender Lala Bhairam (Prem Chopra) is married to a young woman Shashi (Geeta Bisht) who, in turn, is having an affair with a young photo-studio hand Suresh (Cyrus Sahukar). Suresh is a double timer who is also pursuing Madangopal's daughter Bittu (Sonam Kapoor). Bittu secretly wants out of the stuck-in-time Old Delhi; she secretly prepares to audition for a popular reality show Indian Idol in the hope that she will win her way to Mumbai. Roshan comes to appreciate Ali Baig's cosmopolitan tastes and is surprised to learn that he fancied his mother many years ago and has since never married. And Roshan comes to empathise with the lower-caste trash collector girl Jalebi (Divya Dutta) who must endure untouchability at social functions except for when some of the brutish locals seek company. Roshan crosses paths with the loutish inspector Ranvijay (Vijay Raaz) who blithely stretches his authorities to manhandle the locals and becomes acquainted with the assembly-woman who displays political power at every opportunity. In the meantime, the news media is all abuzz with tales of a fearsome terror known only as the "Kala Bandar" (The Black Monkey). This miscreant (never shown clearly in the film) attacks people, steals and has caused the death of a few innocent people. (These deaths are mostly accidental, as in the example of a pregnant housewife who was supposedly startled by a silhouette and fell down a flight of stairs or the unfortunate man who was briefly zapped by a live electric wire.) Nonetheless, the local news picks up on every move by the kala bandar and loudly blares about all his exploits. Jaigopal, the self-proclaimed electronics genius, theorises that the kala bandar likely has an electrical circuit (to zap his victims) and may be electrocuted by water; this rumour is quickly propagated. The film takes several turns. After some initial friction, Roshan and Bittu warm to each other. Roshan intervenes when Bittu is about to receive a prospective suitor arranged by Madangopal. He echoes Bittu's desire to pursue other dreams; this drives the suitor away and brings Madangopal's wrath upon him. He gradually begins to fall in love with her but is confused when Bittu expresses her affections for Suresh (she believes he will support her dreams). Around this time, the kala bandar attacks Old Delhi. The locals bring in a tantrik Shani baba (Akhilendra Mishra) to exorcise the demonic influence of the kala bandar. After an extended havan ceremony, the tantrik baba, clearly a self-aggrandizing actor who dislikes the inter-religious equality practised in the community, speculates that the local mosque must have been built over the ruins of a temple that was demolished for the purpose. He thus initiates a vicious cycle of animosity in the previously harmonious Hindu-Muslim community. After the initial peaceful demonstrations (by rallies and angry meetings), a mob goes on rampage and attacks some of the Muslims and their shops. This prompts one Muslim shop-owner, Mamdu, to set fire to the tree temple. Roshan attempts to make peace but is rebuffed because of his mixed religious parentage. The locals ultimately settle on the fact that the kala bandar is hiding out in the sooni galli (a dark lane known to harbour evil presences) and must be destroyed. They command the simpleton Gobar to fetch a lock of hair from the evil enemy so that the tantrik can burn it and complete the exorcism. Roshan becomes aware of Bittu's plan to elope with Suresh and that Suresh is a low-life two timer. He dons a monkey mask and outfit and stealthily follows Bittu by leaping across the rooftops. In the meantime Gobar ventures into the sooni galli where Jalebi gives him a lock of her hair so he may return in triumph and bring peace to the community. At that moment, Roshan (in his monkey outfit) intercedes in Bittu and Suresh's rendezvous and causes the cowardly Suresh to flee. Bittu raises a loud alarm before Roshan unmasks himself, Roshan tells Bittu he loves her where she also responds to his feelings, the two share a hug, whereupon the angry locals storm the place. Believing Roshan to be the kala bandar, they beat him to within an inch of his life and Mamdu shoots him. Then, Gobar comes up with a startling deduction about the reality of the kala bandar; that the kala bandar is in fact the vices residing inside the people of Delhi 6 and something that the people must defeat within themselves. In the end the neighborhood realizes this and helps Roshan to reach a hospital with the help of an ambulance. But while on the way, Roshan does not respond to the treatment leaving people to believe that he died. In the meanwhile Roshan meets his grandfather (after his death) in the terrace of a building in Delhi. Roshan's grandfather (Amitabh Bachchan) reveals that there is a Kala Bandar in his own heart and that is why he wanted to ask forgiveness to his daughter, Roshan's mother, for not accepting her inter-religious marriage. After that he said he will meet him once again. At that point, Roshan responds to his treatment and everyone is happy that he is not dead. The film ends with Roshan understanding the diversity of Delhi 6. During the end credits, the important characters appears before the mirror and reveal their emotions during their days in Delhi 6. In the early stages of development it was rumoured that Rakeysh was going to cast newcomers for his next film. It was even reported that Aamir Khan's nephew Imran Khan would make his debut with Delhi-6 but this was later revealed to be Jaane Tu Ya Jaane Na. Frequent changes in casting made headlines, with Hrithik Roshan being set to play the main character and then being reportedly replaced by Ranbir Kapoor. Even Akshay Kumar was supposed to play the lead but refused. Rakeysh Omprakash Mehra stated that Abhishek Bachchan was always the first choice for Delhi-6. Date problems for Abhishek Bachchan caused delays, but it all worked out in the end with Abhishek portraying the lead actor. Sonam Kapoor was paired as the leading female character opposite Abhishek Bachchan. Rishi Kapoor and Tanvi Azmi are also a part of the film. The film went on the floors 20 February 2009. Amitabh Bachchan plays the grandfather to Roshan, played by Abhishek Bachchan, whereas Waheeda Rahman plays the grandmother of the same. Production designer Samir Chanda, who had earlier worked with Mehra on Aks (2001) and Rang De Basanti (2006), recreated inner lanes of Old Delhi at Sambhar, a town in Rajasthan with similar architecture. Also for some scenes, historic Jama Masjid was digitally added to the frame as a backdrop. Editing was done by Meghna Aschit and Rakeysh's wife Bharthi. In an interview Rakeysh said that he was not involved with the editing. Delhi-6 was first unveiled on the Dubai International Film Festival. Following the screening was an interactive question and answer round, consisting of the director with the rest of the starcast and a vast audience. During this interaction, Rakeysh spoke about his key influences and the theme of the film, while actors described their experience of working with Rakeysh. A video featuring Abhishek and Sonam's interview can be watched in the reference along with this section. The official trailer was released on 4 January 2009 which featured scenes from Delhi along with Jama Masjid, theatre groups, Red Fort at night, Sonam Kapoor coming out of a public escalator at central park in Delhi and finally Abhishek watching Sonam dancing with the pigeon "Masakalli" on her head. The film was supposed to be released on 13 February 2009, but A. R. Rahman's continued absence from the project led to a delay release. The background score remained incomplete and delayed release by one week. Delhi-6 was finally released on 20 February 2009 and premiered in New Delhi on 19 February 2009. It had its first screening on 15 February 2009 in New York. As of 11 March 2009, Rotten Tomatoes has given the film a 40% rating with 3 fresh and 6 rotten reviews. Pratim D. Gupta of The Telegraph gave two thumbs up, calling it a must-watch for just its "overwhelming audio-visual eruption". Nikhat Kazmi of Times of India rated it three out of five stars, saying, "Watch it for the message of Delhi-6 and the ekdum desi India-feel". Anupama Chopra of NDTV said that the film is a noble failure: "Delhi-6 is ambitious and well-intentioned, but good intentions don’t always translate into good cinema". Rajeev Masand of CNN-IBN gave it 3 stars, saying that it's a story with heart and Delhi-6 isn't great cinema like Mehra's Rang De Basanti and has a frustrating climax. Rachel Saltz of The New York Times stated "Delhi-6 can be maddeningly vague, which robs its ending...of the impact it intends". Shashi Baliga of Hindustan Times gave the film 3 out of 5 saying "Mehra sure has his heart in the right place. But couldn’t he have allowed himself… and us, a little more fun?" Arthur J Pais of Rediff.com gave a much better verdict remarking the film's innovative style and storyline. Amanda Sodhi posted an in-depth write-up about Delhi-6 on PassionForCinema.com, defending it against flak it was receiving. A.R. Rahman is the music director of this film. Prasoon Joshi is the lyricist. The music was released on 14 January 2009 at the Indian Idol 4 competition. The first video of the song "Masakalli" was released featuring Sonam and Abhishek with a pigeon. However, the song was not part of the original film. According to the director, "The song was not really meant to be part of the narrative. I mean, who would think of putting in a song about a dove in a film like Delhi-6? It just happened. When I came to the pre-climax portion of my script, I was stuck. I needed a continuity link taking the narrative to its finale". Other videos released include the title track "Delhi-6", the romantic interlude "Rehna Tu" as well as the folky "Genda Phool," an adaptation of a folk song from Chhattisgarh. Reports of Kala Bandar (Black Monkey) attacks in the city of Delhi as shown in the film are inspired by real reports of much publicised monkey or monkeyman attacks in and around Delhi in 2001. ^ "Delhi-6". BBFC. Archived from the original on 15 April 2009. Retrieved 16 November 2010. ^ "Rakeysh Mehra's Delhi-6 to star Hrithik Roshan and Om Puri". m IndiaFM. Retrieved 25 September 2006. ^ "Abhishek Bachchan to do three Rakeysh Mehra films". m IndiaFM. Retrieved 25 September 2006. ^ "Ranbir Kapoor replaces Hrithik Roshan". Radiosargam.com. 4 February 2007. Retrieved 6 January 2012. ^ "Hrithik back in Delhi-6". Humsurfer.com. Retrieved 6 January 2012. ^ "Sonam's next with Abhishek". The Times Of India. India. 7 November 2007. Retrieved 7 November 2007. ^ "Earth Times: show/165473.html". www.earthtimes.org. ^ "Dilli 6 takes off finally". Inhome.rediff.com. 20 December 2007. Retrieved 6 January 2012. ^ "Mumbaimirroe.com: Profile on Delhi-6". Archived from the original on 17 February 2012. Retrieved 6 January 2012. ^ Deepanjana Pal (September 2013). "Places Other Than This". The Big Indian Picture. Retrieved 2013-12-06. ^ "I'm dying to see what I've done in 'Delhi 6', says Rakeysh Mehra". Thaindian.com. 6 July 2008. Retrieved 6 January 2012. ^ "Delhi 6 unveiled at Dubai film festival". Delhi-6-movie.blogspot.com. Retrieved 6 January 2012. ^ "Delhi-6". Rotten Tomatoes. IGN Entertainment, Inc. Archived from the original on 27 February 2009. Retrieved 11 March 2009. ^ Gupta, Pratim D. (21 February 2009). "Sights & sounds of an address". The Telegraph. India. Retrieved 19 September 2009. ^ Azmi, Nikhat (19 February 2009). "Review of Delhi-6 at Times". The Times of India. India. Retrieved 25 February 2009. ^ Chopra, Anupama (19 February 2009). "Delhi-6 movie review at NDTV". movies.ndtv.com. NDTV. Archived from the original on 23 February 2009. Retrieved 25 February 2009. ^ Masand, Rajeev (20 February 2009). "Masand's Movie Review: Delhi-6, a film with heart". ibnlive.com. CNN-IBN. Retrieved 25 February 2009. ^ Saltz, Rachel (18 February 2009). "Movie Review - Delhi-6 - Indian Soul". The New York Times. movies.nytimes.com. Retrieved 25 February 2009. ^ Baliga, Shashi (20 February 2009). "6 degrees of confusion". Hindustan Times. India. Archived from the original on 23 February 2009. Retrieved 25 February 2009. ^ Pais, Arthur J. (19 February 2009). "Rediff.com review of Delhi-6". rediff.com. Rediff. Retrieved 25 February 2009. ^ Bhandari, Rohini. "A.R. Rahman Golden globe call". Businessofcinema.com. Retrieved 6 January 2012. ^ "Dove song in movie was not planned". Movies.indiainfo.com. 9 November 2009. Archived from the original on 10 January 2009. Retrieved 6 January 2012. ^ "Delhi-6 music out on 14th January". Rahmaniac.wordpress.com. 10 January 2009. Retrieved 6 January 2012. ^ "Delhi-6 by A. R. Rahman". Amazon.com. Retrieved 2009-03-05. ^ Rathore, Tajpal (6 March 2009). "A R Rahman Delhi - 6 Review". BBC Music. Retrieved 30 May 2013. In stark contrast, Dilli-6, sung by Blaaze (an Indian-based rapper), is undisputedly the boldest track on the album. ^ "rediff.com: It's a man! It's a monkey! It's a..." www.rediff.com.